So, on Thursday, I watched all six “Harry Potter” movies, back-to-back. It was a marathon that began at around 7:30 a.m., and ended a little before 11 p.m. My editor came over with lunch (thanks again, Lynn! ), Pagliacci’s brought dinner, and the entire event was sponsored, so to speak, by Diet Coke. I took no more than 10 minutes between movies, skipped end credits (they weren’t readable on my TV anyway), and ultimately ended up watching about 14 hours of movies. My cat, who spent most of the day (and evening) on my lap snoozing, very much enjoyed the marathon; so, somewhat to my surprise, did I. I’ve enjoyed all the “Potter” movies — particularly from the third movie on, where the overall quality of the directing and acting takes a huge leap — but wasn’t sure they’d hold up as one unified mega-movie. They do indeed, and while I’m not necessarily recommending that you do it in one fell swoop (or what a friend of mine calls “one foul soup”), there are plenty of worse ways to spend, perhaps, a weekend than in watching the kids at Hogwarts grow up. I’ll be writing about this in detail for a story to be published Sunday, Nov. 14 (in anticipation of the arrival of “Harry Potter and the Deathly Hallows, Part I” — NOT in 3D, thank you very much — on the 19th). But here are a few observations. Note that while I saw all of the movies in theaters when they opened, some more than once, I never went back and revisited any of them, so in some ways it was like seeing the older ones anew. 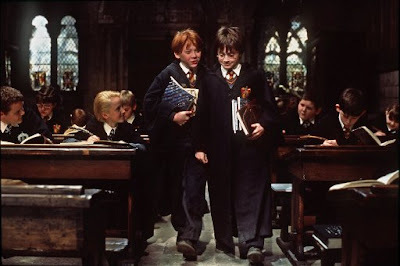 — Obvious, of course, but it bears saying: In the first movie, Daniel Radcliffe, Rupert Grint and Emma Watson are little. They’ve been teenagers on screen for so long we forgot how young they were when this all began. The boys’ voices hadn’t changed yet, and Watson spoke in a little-girl chirp. — When the series began, Watson was easily the strongest performer of the three; she already had a confidence and sense of comic timing that was utterly charming (and very Hermione). Radcliffe, over the six-movie series, is the most improved and now handles difficult emotional scenes with honesty and grace; Grint has established himself as a fine comedian (especially in movie #6) but a less confident actor. It’s also interesting to watch the young actors in the lesser roles, none of which (as far as I can tell) has been recast. The kid playing Draco Malfoy grew into his role nicely; as did the actor playing Neville Longbottom, and Evanna Lynch was perfect as Luna Lovegood from the moment she walked onscreen. The only disappointment: Bonnie Wright, who had no lines and only a brief appearance as Ginny Weasley in the first movie, but now brings little personality to a much-enlarged role (though not as enlarged as it is in the books). — The adult actors are, almost without exception, so vivid you don’t even notice that they’re not in the movie all that much. Helena Bonham Carter, for example, has barely any screen time as Bellatrix Lestrange, but who could forget her? Even Alan Rickman’s delicious Snape — and some grown-up really needs to invent a drinking game in which you take a shot every time he pauses between words that aren’t usually paused between — only has a few minutes here and there. — Though I didn’t watch the end credits for time-saving reasons (they’re at least ten minutes per movie, thus saving me more than an hour overall), I did fast-forward through them to see if there was a bonus scene at the end. Only one movie has one: #2, “Harry Potter and the Chamber of Secrets,” and yes, it’s worth a look. — Trivia question of the day: Six actors from the 1995 movie “Sense and Sensibility” turn up in the Harry Potter universe; can you name them?